A little of the pressure to contribute right away with his new club has been lifted from Yonder Alonso. Hitting a grand slam in just the second game of the season will take away some stress. "After this game, doing something for the team, I think it helps you get settled a little bit, which is nice," Alonso said. Alonso hit his third career grand slam in the first inning, Yan Gomes added a two-run shot and the Cleveland Indians held on for a 6-5 win over the Seattle Mariners on Saturday. Alonso and Gomes provided the big blows off Seattle starter James Paxton, who struggled with command and failed to make it out of the fifth inning. Alonso was the beneficiary of a pair of two-out walks in the first inning to Edwin Encarnacion and Rajai Davis that loaded the bases. Davis' at-bat was crucial as he fouled off three 3-2 pitches before walking. Paxton (0-1) left a fastball in the middle of the plate and Alonso clubbed his first grand slam since June 6, 2015, when he was with San Diego. It was just his 12th career home run against left-handed pitching. "(Rajai) had what felt like a 20-pitch at-bat," Alonso said. "Just kept fouling off pitches and the guys obviously before him had really good at-bats. ... I think it was all brought because of the guys in front of me." Gomes' two-run shot became the difference, driving a 2-2 fastball from Paxton to the deepest part of Safeco Field. Paxton gave up six earned runs and walked four. "I wasn't locating my fastball very well, and when I did, it was over the plate," Paxton said. Paxton's day would have been worse if not for Ichiro Suzuki showing that he can still be a defensive star even at age 44. Suzuki robbed Jose Ramirez of a home run leading off the third inning, timing his leap perfectly to reach above the wall in left field and pull back a ball that appeared destined for the bullpens beyond the fence. Suzuki also had his first two hits for Seattle since July 21, 2012, before he was traded to the New York Yankees. Suzuki reached on an infield single and scored in the third inning, and moved into 21st place by himself on the all-time hits list with a two-out single off Andrew Miller in the seventh. Suzuki passed Cap Anson on the hits list with 3,082. "I'd never made a play like that in left field, but I was able to get to the ball quick and get to the wall. I'm glad it worked out," Suzuki said through an interpreter. Cleveland starter Carlos Carrasco wasn't at his best, either, but pitched into the sixth inning to get the victory. Carrasco (1-0) gave up five runs and seven hits, but didn't walk a batter. 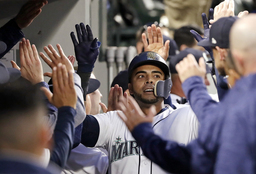 Seattle worked its way back from the early four-run deficit on the strength of home runs by Mitch Haniger and a two-run shot by Nelson Cruz in the sixth inning to pull within 6-5. Cruz had just one home run in his first 48 at-bats last season; he's got two in six at-bats this year. But Seattle could never draw even as Zach McAllister and Andrew Miller pitched 2 1/3 scoreless innings, before Cody Allen pitched the ninth for the save. As if Seattle needed more injury issues, Cruz left the game with a twisted right ankle after slipping on the dugout steps following his home run in the sixth inning. X-rays were negative but Cruz will undergo an MRI on Sunday. Cruz was wearing a protective boot after the game. "When I heard that, I wanted to throw up," Seattle manager Scott Servais said. "I really don't know any other way to put it. Our club has just battled through a bunch of nagging injuries here in spring training and early in the season here." Cruz's absence was felt in the eighth after Robinson Cano led off with a bloop double but never advanced. Guillermo Heredia, pinch-hitting for Cruz, was unable to bunt Cano to third and flew out. Miller finished the inning with strikeouts of Kyle Seager and Ryon Healy. Indians: OF Michael Brantley is expected to remain in Arizona through at least Tuesday before a decision is made on where he goes as he continues to recover from offseason ankle surgery. Mariners: RHP Erasmo Ramirez threw about 25 pitches in a simulated game on Friday as he continues to recover from a strained lat muscle. Ramirez is likely to throw another simulated game before going out on a rehab assignment. Indians: Trevor Bauer gets his first start of 2018. Bauer won a career-high 17 games in 2017 and had a career-low ERA for a full season of 4.19. Mariners: Mike Leake makes his 2018 debut trying to build on his close to 2017. Leake was 3-1 with a 2.53 ERA in five starts after being acquired by Seattle late last season.